This year’s Digital Boot Camp explored digital curation, and the projects often resulted in data visualizations such as this one, created by Mary Naydan ’15. 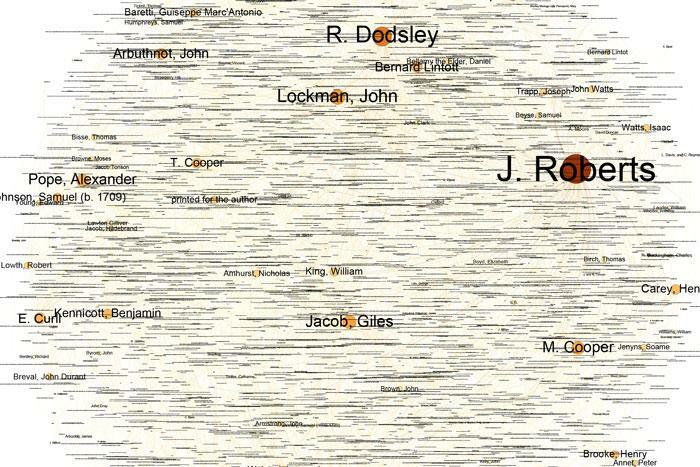 The image is a visual representation of the frequency of occurrence of various 18th-century poets across 17,422 lines of data. Projects. They usually have tight parameters, strict requirements and uncrossable boundaries. Dickinson's Digital Boot Camp (DBC) projects are a little different. Funded by a grant from the Andrew W. Mellon Foundation, Dickinson’s DBC was launched last year under the guidance of Chris Francese, Asbury J. Clarke Professor of Classical Studies and Dickinson’s digital-humanities overlord. This year, the DBC found its physical and spiritual home in Dickinson’s Archives & Special Collections and focused less on new-media production and more on digital curation. What this means, essentially, is that students took existing texts, used XML to make them readable by both machines and people and then mined them for data and created visualizations of those data (such as the one in the photo above). Katy Purington ’15 (classical studies) jumped into the boot camp straight from a fall internship with the classics department and its Dickinson College Commentaries (DCC), through which she analyzed visual interpretations of the Aeneid. Harris Risell ’16 (English) says he was initially drawn to the DBC when he learned that many participants each year go on to work with faculty members on digital projects. Risell is now applying his new skills to a project for Belk’s Web site, the Pulp Magazines Project, which includes marking up American fiction magazines published from 1896 to 1946, aggregating that data through the Advanced Research Consortium and partnering with ModNets (Modernism on the Net) and the Library of Congress. Two other students are also working with their professors on post-DBC projects: Maurice Royce ’16 (computer science) is collaborating with Blake Wilson, professor of music, to build a public database with information about oral poetry from the Italian Renaissance, and Mary Naydan ’15 (English) is working with Jacob Sider Jost, assistant professor of English, on a project that has collected 17,422 lines of entries on 18th-century poets and their books. For Risell, the DBC brought some order to projects he hasn’t even started yet. The DBC was additionally facilitated by Waidner-Spahr Library’s Don Sailer '09, library digital projects manager; Daniel Plekhov ’14 and Michael D'Aprix ’14; and Leah Orr, visiting assistant professor of English. Read about last year's DBC: "Less Yak, More Hack."